Outdoor Artwork- When Mike Parsons was asked to design a large piece of art that will be thrown in the trash in a few years, he jumped at the chance. His mural may be temporary, but the commission has made the local artist one of the pioneers of an effort to beautify Toronto’s construction sites. The mural that he’s created will be printed onto the hoarding that surrounds the site for the Bond Condos, a 40-storey building that’s about to get under way at the corner of Adelaide and John Streets in Toronto’s entertainment district. It’s one example of the art that will increasingly be seen on hoarding as construction sites become ubiquitous in the city as a result of the condo boom. 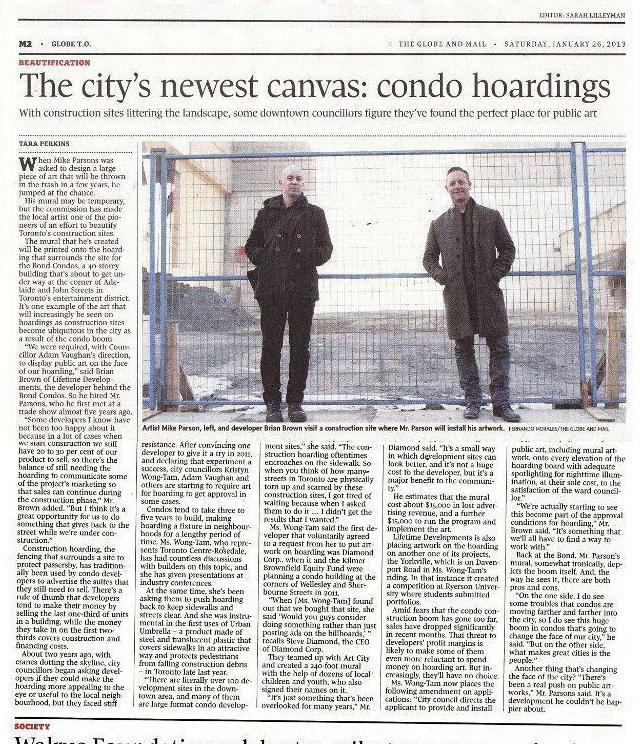 “We were required, with councillor Adam Vaughan’s direction, to display public outdoor artworks on the face of our hoarding,” said Brian Brown of Lifetime Developments, the developer behind the Bond Condos. So he hired Mr. Parsons, who he first met at a trade show almost five years ago. Construction hoarding, the fencing that surrounds a site to protect passersby, has traditionally been used by condo developers to advertise the suites that they still need to sell. There’s a rule of thumb that developers tend to make their money by selling the last one-third of units in a building, while the money they take in on the first two-thirds covers construction and financing costs. About two years ago, with cranes dotting the skyline, city counsellors began asking developers if they could make the hoarding more appealing to the eye or useful to the local neighbourhood, but they faced stiff resistance. After convincing one developer to give it a try in 2011, and declaring that experiment a success, city councillors Kristyn Wong-Tam, Adam Vaughan and others are starting to require art for hoarding to get approval in some cases. Condos tend to take three to five years to build, making hoarding a fixture in neighbourhoods for a lengthy period of time. Ms. Wong-Tam, who represents Toronto Centre-Rosedale, has had countless discussions with builders on this topic, and she has given presentations at industry conferences. At the same time, she’s been asking them to push hoarding back to keep sidewalks and streets clear. And she was instrumental in the first uses of Urban Umbrella – a product made of steel and translucent plastic that covers sidewalks in an attractive way and protects pedestrians from falling construction debris – in Toronto late last year. Ms. Wong-Tam said the first developer that voluntarily agreed to a request from her to put artwork on hoarding was Diamond Corp., when it and the Kilmer Brownfield Equity Fund were planning a condo building at the corners of Wellesley and Sherbourne Streets in 2011. “When [Ms. Wong-Tam] found out that we bought that site, she said ‘Would you guys consider doing something rather than just posting ads on the billboards,’” recalls Steve Diamond, the CEO of Diamond Corp. They teamed up with Art City and created a 240-foot outdoor artwork with the help of dozens of local children and youth, who also signed their names on it. He estimates that the mural cost about $15,000 in lost advertising revenue, and a further $15,000 to run the program and implement the art. Lifetime Developments is also placing outdoor artwork on the hoarding on another one of its projects, the Yorkville, which is on Davenport Road in Ms. Wong-Tam’s riding. In that instance it created a competition at Ryerson University where students submitted portfolios. Amid fears that the condo construction boom has gone too far, sales have dropped significantly in recent months. That threat to developers’ profit margins is likely to make some of them even more reluctant to spend money on hoarding art. But increasingly, they’ll have no choice. Back at the Bond, Mr. Parson’s mural, somewhat ironically, depicts the boom itself. And, the way he sees it, there are both pros and cons. Another thing that’s changing the face of the city? “There’s been a real push on public artworks,” Mr. Parsons said. It’s a development he couldn’t be happier about. This article about Mike Parsons' outdoor artwork appeared in the Jan 26 paper edition of Globe & Mail, the online Globe & Mail, and the Ward 20 News website.